DSEI (Defence & Security Equipment International) is one of the world’s largest arms fairs. Hundreds of people got in the way of its set-up at London’s ExCeL Centre in September 2017. Dabke-dancing, aerobics, a gig on a flatbed truck, abseilers dangling from a bridge, theatre, military veterans undertaking unofficial vehicle checks for banned weapons, Kurdish dancers and rebel clowns, religious gatherings, hip-hop artists, radical picnics, a critical mass of cyclists, conference workshops, Daleks, political choirs, and lots of people in arm-locks all blocked the entrances to the DSEI arms fair repeatedly over the course of a whole week. 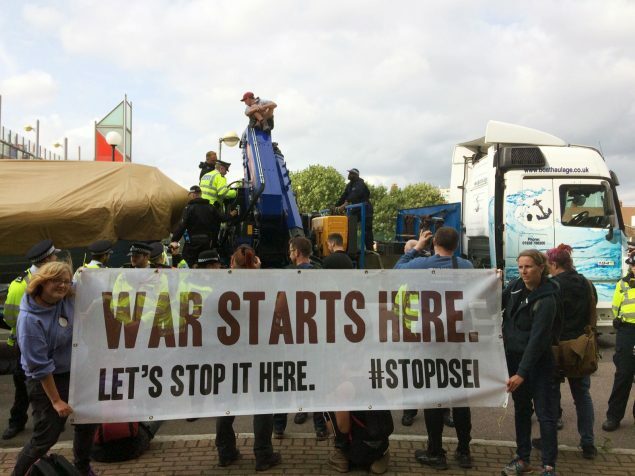 From 4 to 11 September, rolling blockades disrupted the set up of the arms fair and forced the arms trade into the public eye. 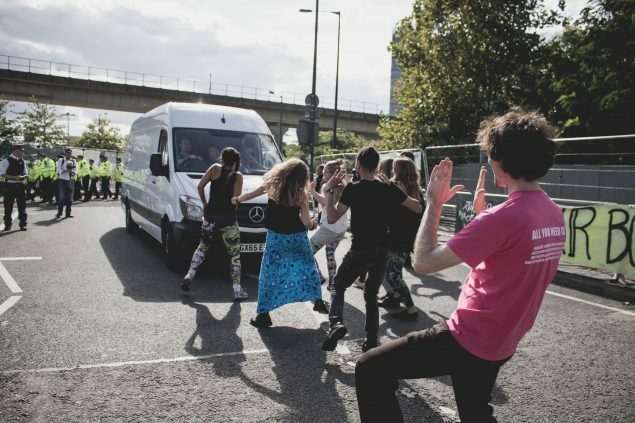 The Stop Arming Israel day of action used creative activities to block the road, including Dabke dancing, a football game with giant balls, and live music and DJs playing late into the evening. Protesters heard how Israel markets its weapons as “battle-tested” on the Palestinian population. At the same time, they blocked a Sandcat vehicle from Israeli manufacturer Plasan from entering the fair. Faith groups came together for a day of peaceful nonviolent resistance and prayer, to say no to the arms trade and no to profiteering from war. Protesters locked themselves together in arm tubes to block the road and had to be cut out before vehicles could get through. Abseilers came from above to block the road below them for many hours. CND Regional Groups and Trident Ploughshares coordinated actions to say No to Nuclear. Many of the companies that are central to Trident replacement were at DSEI. 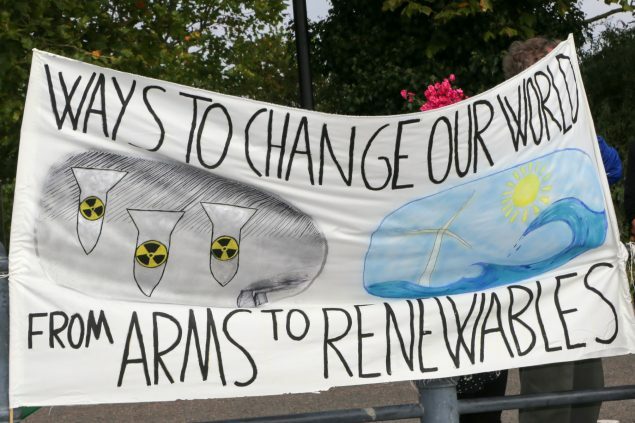 Arms to Renewables actions showcased positive alternatives. Roads were blocked for hours at a time, with police taking six hours to cut some protesters out of their blockades. 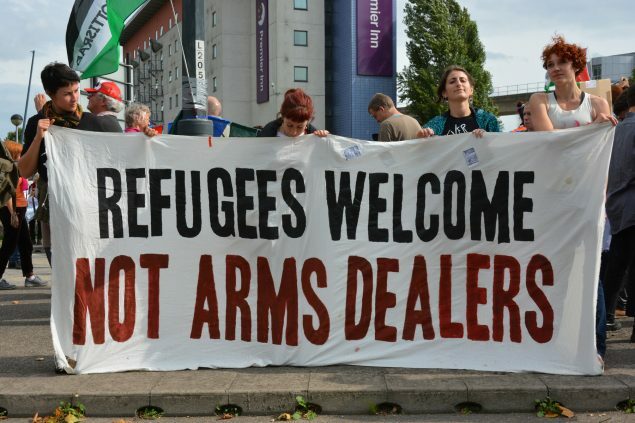 Many of the companies at DSEI directly profit from conflicts that drive people from their homes, as well as from deadly borders and the inhumane treatment of migrants. 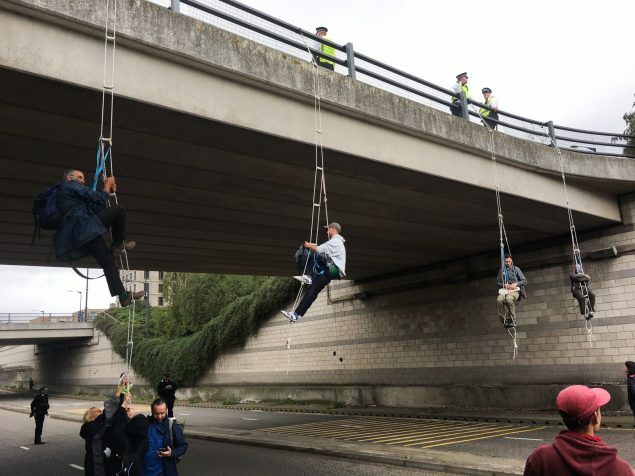 The day of action was organised by migrant-led feminist and queer groups, and featured workshops, theatre and dance led by people on the front lines of military and border violence. 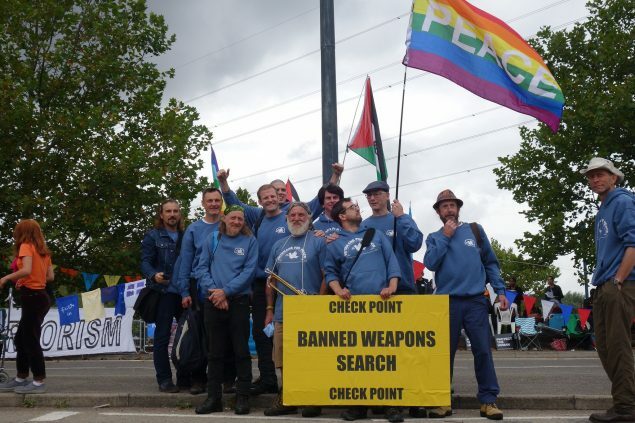 Veterans for Peace carried out citizen’s inspections of vehicles arriving at the Arms Fair to ensure that no weapons banned under the Geneva Conventions were being brought in. 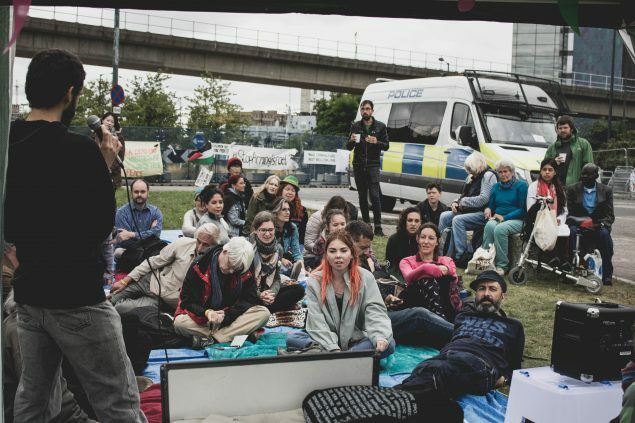 A picnic blocked the road at lunchtime, with amazing food from North London Food not Bombs. All African Women’s Group performed their play, We Are Here Because You Were There. Conference at the Gates moved academia out of the lecture theatre and onto the street, blurring the lines between activism and academia. 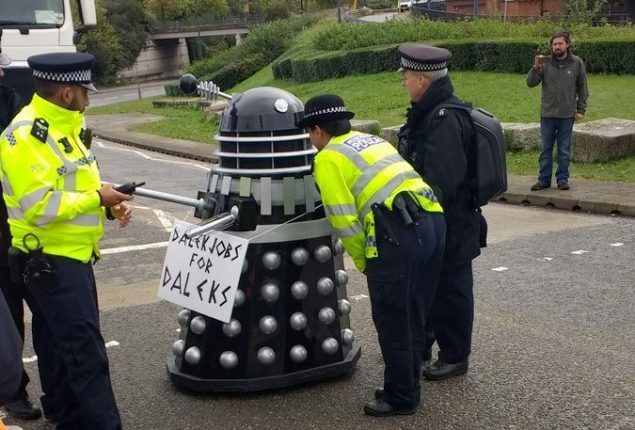 Meanwhile, striking Supervillains from all over the universe picketed the arms fair, to protest being put out of a job by human rights abusers from all over the planet. 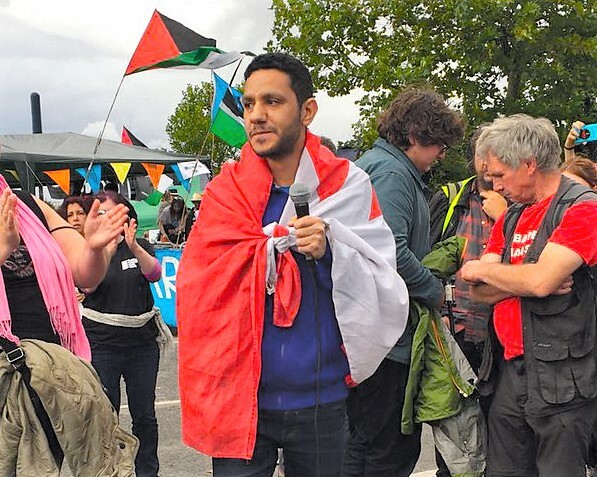 Sayed Alwadaei from Bahrain Institute for Rights and Democracy gets ready to address the crowd. There are decent people who will stand against war, and we are so proud to be part of this movement. 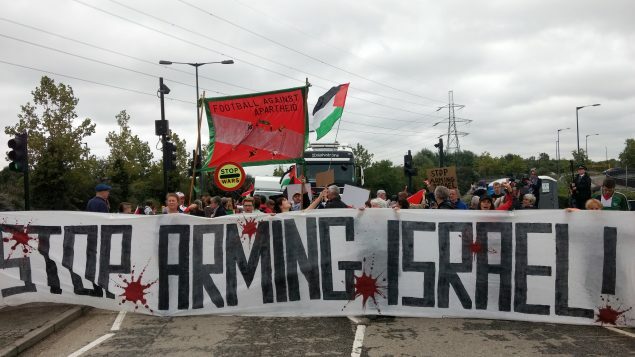 War Resisters’ International brought together people from around the world for a seminar which explored how the arms trade is international – and so is our resistance. 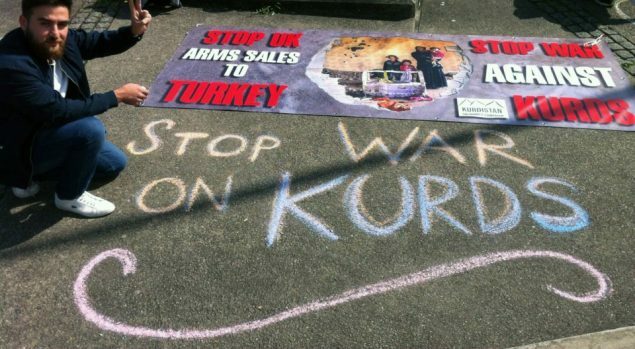 Kurdish solidarity protesters calling for the UK to Stop Arming Turkey held the road with speeches, dancing and singing. Several public figures spoke out against DSEI. Thank you to the hundreds of people who put their bodies in the way of the arms fair, and also to the many thousands of others who amplified the protests by signing petitions and by speaking out online and in their own communities. Even more people helped in diverse ways in order to make the protests possible, from pet-sitting so others could protest, to making beautiful props or food for protesters, to sending messages of support.